Opponents and supporters of the Skowhegan Indians name sat on either side of the room. Action on whether to keep or retire the name could come on March 7. 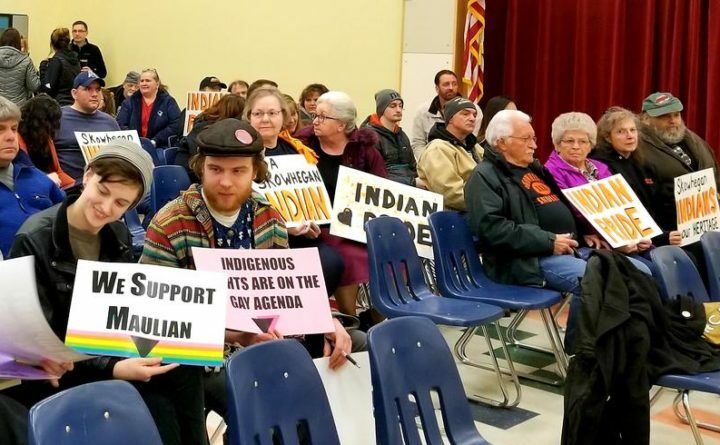 The controversy over Skowhegan High School’s use of the name “Indians” continued Thursday night as both sides presented what might be their last chance for public testimony before the Maine School Administrative District 54 school board takes action. The room was evenly divided between mascot supporters on one side, and opponents on the other. Many held signs and said the issue would not be “going away.” The board offered limited opportunity for testimony from both sides, with two to three representatives allowed to speak. “We’re not responsible for the way they interpret what we use as our school mascot. If they’re offended, that’s too bad,” Michelle Kelso said. Kelso said she also has a right to her identity as a local person who spent four of what she describes as the “best” years of her life as a Skowhegan High School “Indian.” Neither the name nor the mascot were ever meant to be offensive she says, but she also says that, sometimes, getting offended is just a fact of life. Opponents of the Skowhegan High School Indians name have said that legal action is likely should the school board choose to retain it. Such names and mascots, they say, create a hostile learning environment for native students, and may constitute a civil rights violation, a message reinforced by the presence of Zachary Heiden, legal director with the ACLU of Maine. Supportive of the Indians name, however, was Kathy LeBrun, who identifies as Passamaquoddy. She told the board that Ambassador Dana did not speak for all native people. “Not one person in my family has said anything about being offended,” LeBrun said. The MSAD 54 school board plans to take up the matter, perhaps for the last time, in a public work session at 7 p.m. Thursday, March 7.